Place a square of milk chocolate on a graham cracker. Toast a marshmallow and put on top of the chocolate, then a second graham cracker on top of the toasted marshmallow and squeeze and you will want "s'more". Since then, s'mores have taken on different shapes and sizes. 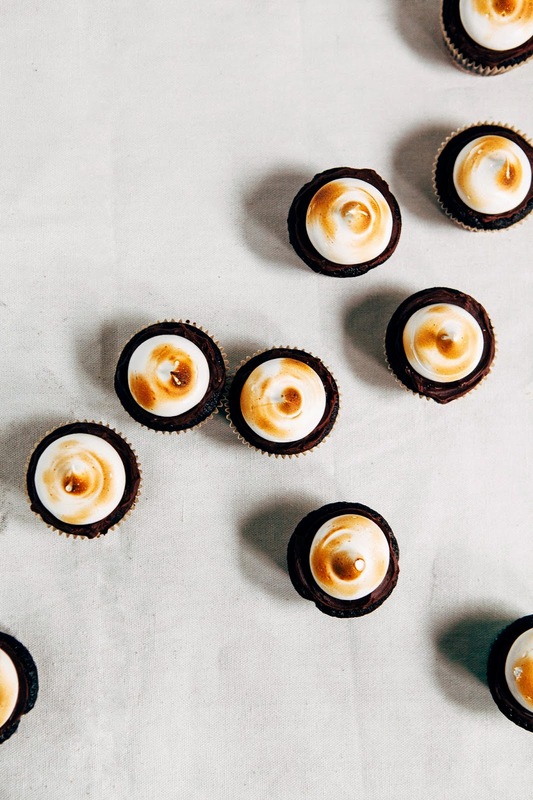 Just googling around, there are a TON of recipes for different s'mores desserts: brownies, ice cream cakes, cookie bars, pie and even macarons! Okay, wait, hold the phone. Three types of chocolate and two types of graham flavor??? What on earth does that even mean?! Well, lemme break it down for you. And then on top of the crust is a double chocolate graham cake base. Double chocolate since the cake gets its chocolate flavor from both cocoa powder and melted dark chocolate. Are you keeping count? That's 2/3 chocolate types I claim in this recipe. As for the graham, I also used a generous amount of graham flour in the batter to give the cake a hearty crumb. What is graham flour? I've written about its history in this recipe for whole grain chocolate muffins, but a quick recap is this: graham flour is a type of high-fiber, vitamin-dense whole wheat flour that was used in the original graham cracker recipe back in the mid 1800s. Unfortunately, graham crackers back then were chalky, tasteless and generally terrible since they consisted of only graham flour and water. Graham crackers today are much, much better, especially since, you know, they now have butter and sugar. But why would I add such a weirdly healthy and kind of hippie ingredient to chocolate cake? Because together with chocolate, graham flour works magic. I swear to god it adds a flavor that's reminiscent of toasted nuts that, in this particular cupcake recipe, is further enhanced by the graham cracker crumb base. It's all sorts of amazing and wonderful. So contrary to what you see in this picture above, the marshmallow meringue icing isn't made from the weird, super-processed, jet-puffed marshmallows you get in the supermarket made from all sorts of terrible chemicals and extra animal parts. Instead, this icing comes from a homemade candy syrup whipped up with egg whites to create marshmallow meringue — meaning that it is 100% vegetarian. 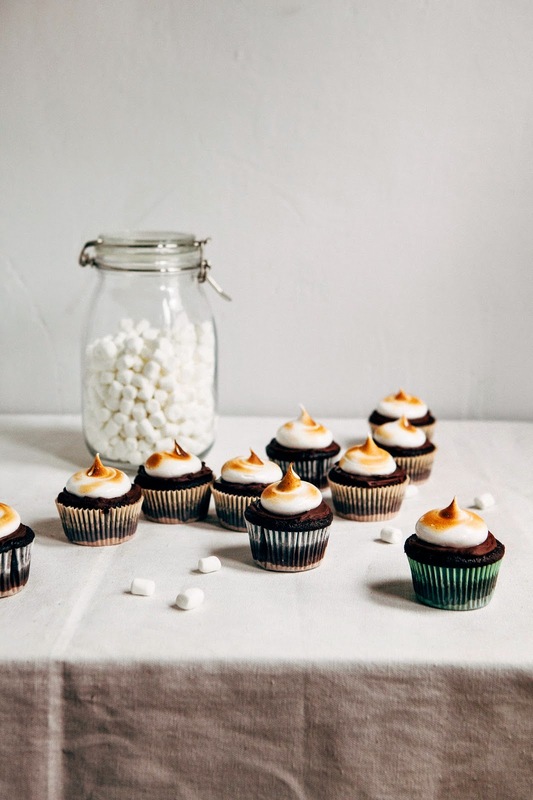 Seriously, so many of my tree-hugging Portland friends at my rock climbing gym cried tears of joy when I told them that they could eat these marshmallow topped cupcakes. And there you have it! 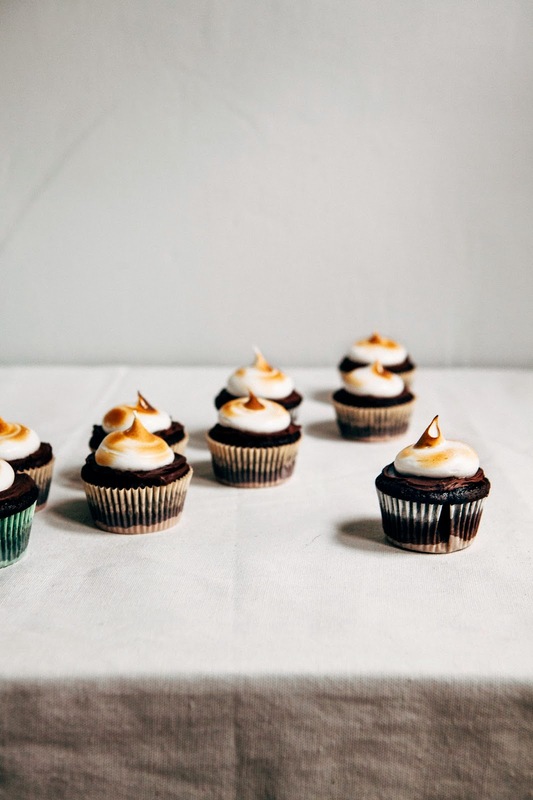 My s'mores cupcake breakdown shakedown! Enjoy — this recipe's definitely going in the Classics (a.k.a. best recipes eveerrr) section of my Recipe Index. It's one of my favorites of the year so far, and maybe even on the blog as a whole. It's that good. Promise. Graham flour is available online or in specialty health food stores. One of my favorite things about graham flour is that it lasts longer than other whole grain flours, so you can buy in bulk and use throughout the year. It especially works well in chocolate baked goods, and you can substitute graham flour for up to half of all-purpose flour in lighter baked goods. However, I wouldn't use it in white cakes or angel food cakes since it tends to be heavier. This chocolate graham cake is adapted from a recipe for double chocolate cake from Miette, one of my favorite cookbooks from an adorable bakery in San Francisco. 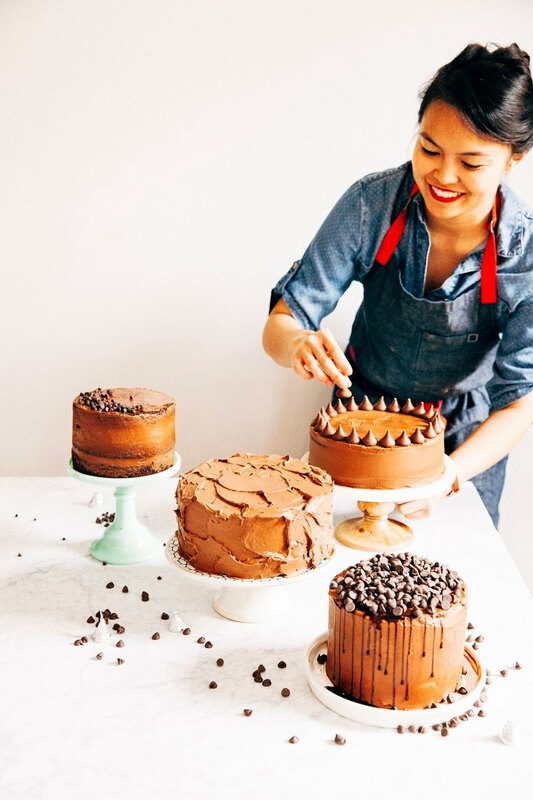 Their chocolate cake recipe is one of my favorites to make and play around with — the cake isn't that sweet, and instead has a rich, complex and bittersweet chocolate flavor. In addition to its flavor, the cake is crazy moist and has a wonderfully delicate and light crumb that's achieved by a rather weird method: straining the batter through a fine mesh sieve to get rid of any lumps, as opposed to trying to stir them into the batter. I know that it's kind of fussy but straining the batter prevents the overmixing that leads to dense, heavy cake. It's worth it to strain, I promise. Similarly, the marshmallow meringue icing comes from Miette as well. Unfortunately, the icing tends to deflate overnight, so it's best to make and consume the icing on the same day. I used a chef's torch to lightly toast the marshmallow meringue and give it that pretty, toasted look. If you don't have a chef's torch, you can use your oven broiler. 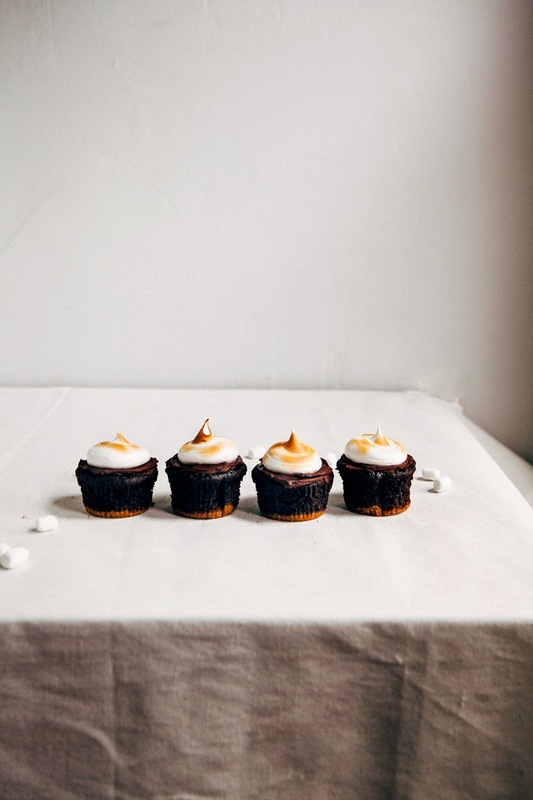 Place the cupcakes on a cookie sheet in the top shelf of the oven and broil for a minute to get a nice toasty marshmallow look — but watch the cupcakes carefully, since the meringue turns to brown and burn fast. There's no saving them once they're burned. Center a rack in the oven and preheat to 350 (F). Prepare 2 muffin trays by lining each cavity with cupcake liners. In a medium bowl, use a rubber spatula to stir together 1 1/2 cups graham cracker crumbs, 2 tablespoons granulated sugar, 1 teaspoon kosher salt and 5 tablespoons melted and cooled unsalted butter until evenly coated. Use a 1 tablespoon measuring spoon to portion out a tablespoon sized scoop of the mixture in the bottom of each baking cup. Use your fingers (or one of these nifty tart tampers) to press down the graham cracker crumbs to the bottom of each liner until they form a solid crust. Bake in the preheated oven for 5 minutes to allow the base to harden, before transferring to wire racks to cool for a minimum of 15 minutes. While the graham cracker crusts are cooling, make the chocolate cake batter. Be sure to keep the oven on! To make the chocolate cake batter, whisk together 1 cup all-purpose flour, 1/2 cup graham flour, 1 1/4 cups natural unsweetened cocoa powder, 1 1/2 teaspoons baking soda, 1/2 teaspoon baking powder and 3/4 teaspoon kosher salt in medium bowl until fully incorporated. Set aside. Place 2 ounces finely chopped 70% cocoa chocolate in a medium, heatproof bowl (preferably with a spout or a rim to make your life easier) and pour 1 cup boiling water over the chocolate. Whisk until the chocolate is melted, and allow the mixture to cool for 15 minutes. In a liquid measuring cup, whisk together 1 cup buttermilk and 1/2 teaspoon pure vanilla extract. Set aside. In the bowl of a freestanding electric mixer fitted with a whisk attachment, whisk 2 large eggs on medium-high speed until light and foamy, about 2 minutes. Reduce the mixer speed to its lowest setting and slowly pour in 1/2 cup vegetable oil, whisking for 30 to 60 seconds until combined. With the mixer still on low, slowly pour in the cooled chocolate mixture into the egg mixture. Once the chocolate has been added, slowly pour in the buttermilk and vanilla mixture. Add 2 1/4 cups granulated sugar and continue to whisk until the batter is smooth and liquid, about 2 minutes. Stop the mixer. Remove the bowl from the mixer and add the dry ingredients (from the 2nd step). Use a rubber spatula to mix into the liquid ingredients until just incorporated, scraping down the sides of the bowl and lifting and folding in from the bottom and center of the bowl. Whisk until the dry ingredients are just incorporated — at this point, the batter will still look a little lumpy, but that's okay. Pour the batter through a fine-mesh sieve over a large bowl to remove any lumps. Use a rubber spatula to press against any solids left in the sieve to push through as much batter as possible, but no need to overdo it. Disregard the remaining large lumps. Use a 1 tablespoon sized cookie dough scoop to divide the strained batter evenly between the graham-crusted cupcake liners, filling each cup up to two-thirds full with batter (each of my cupcakes had about 2 tablespoons of batter). 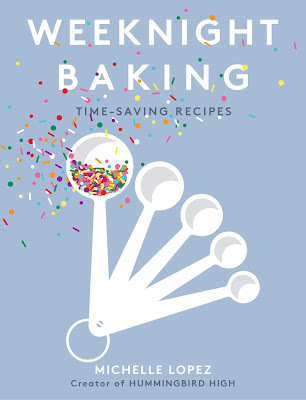 Bake in the preheated oven for 25 to 30 minutes, or until a skewer inserted into the center of a cupcake comes out clean and the cupcake tops spring back when gently poked. Transfer the pans to a wire rack and allow to cool completely in the pan. 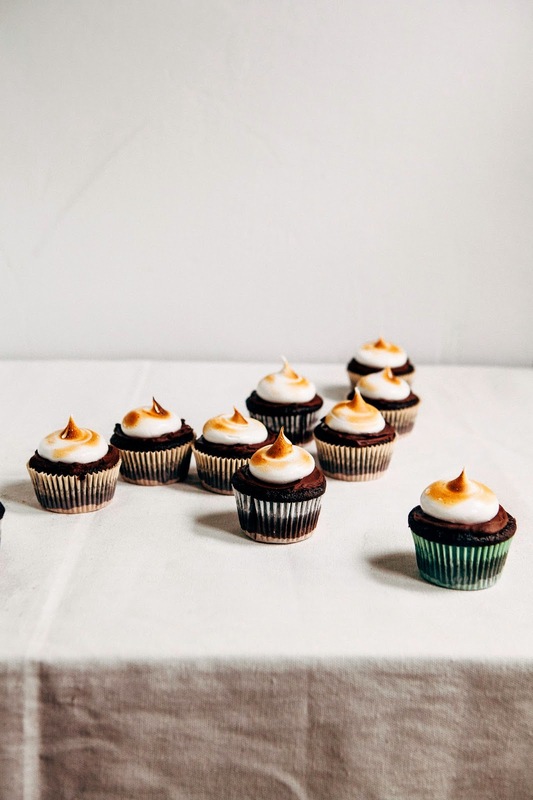 When the cupcakes have cooled completely, make the chocolate ganache and marshmallow meringue frostings. In a small, heavy bottomed saucepan over medium-low heat, melt together 4 ounces finely chopped chocolate, 4 tablespoons unsalted butter, and 1 teaspoon corn syrup, using a rubber spatula to stir constantly until completely melted and combined. Remove from heat and allow to cool in room temperature for about 20 minutes until mixture thickens to a spreadable consistency. Once the mixture is spreadable, work quickly and use a small offset icing spatula to spread about 1 1/2 teaspoons of chocolate on the top of each cupcake. If the frosting hardens too much and becomes difficult to work with, reheat over medium-low heat, whisking constantly until the mixture becomes spreadable again. In a medium, heavy bottom saucepan over medium-low heat, combine 1 1/2 cups granulated sugar, 1/4 teaspoon cream of tartar and 1/4 cup of water. Whisk constantly until the sugar starts to dissolve, continuing to do so until the mixture reaches 240 (F) as measured by a candy thermometer. When the mixture reaches 240 (F), it should be syrupy. Immediately transfer to a heatproof liquid measuring cup and work quickly to make sure that it maintains its temperature. Use immediately by transferring to a piping bag with a large round tip. Pipe a generous dollop of icing onto each cupcake. Once the cupcakes have all been frosted, use a culinary chef's torch to gently toast each dollop to give it that pretty toasted look. Enjoy immediately! Oh my gosh- these are *a dream*. Thanks for filling me in on graham flour- I'll have to check some stores and see if I can find it! 4 layers of s'mores heaven??? I think the girl scouts better call you to start producing these big time! Michelele I love the contrast of texture and colour in your photographs; the white background makes them pop! Ok, so the first recipe for s'mores is the absolute best!! So happy you shared that with us...but these cuppy s'mores are amped up!! Total chocolatey babes!! Beautiful, Michelle! The way the meringue icing is torched reminds me of a couple brushes of burnt orange in watercolor across a pristine sheet of paper. I love Miette, too - every time I'm home in the bay area I can't resist stopping by, even if it's just to see all the pretty setups!! I'll have to go hunt down graham flour. You've got my gears turning for chocolate + graham flour project! OMG YES. OMG. YES. 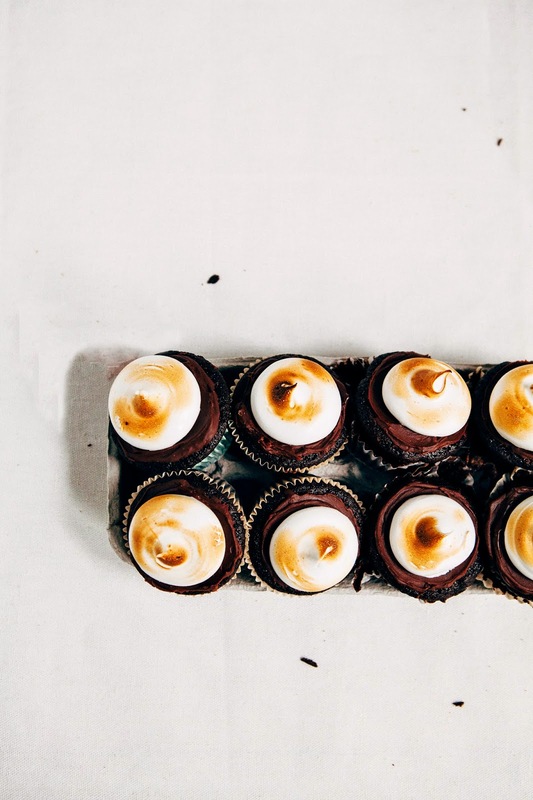 Holy schmoly this is incredible -- I was actually JUST thinking the other day that s'mores cupcakes seem like they'd be incredible but I'd just miss that actual melted chocolate so much.....and then you went. and put it. in. the cupcake. This is why you are a BAMF. I love this so so much!!! And I can't wait to try that marshmallow meringue! I've been doing crazy research lately for a meringue topping (code for: I am super scared to try it) and your version is calling to me, esp with all these helpful directions. So awesome. Love all of this, lady!! I definitely agree with you that Hershey's chocolate can be waxy; it also gets weirdly stretchy if it gets melty. These cupcake are gorgeous! It's become my secret ingredient in most of my chocolate cakes! I hope you give it a try! Thanks Belinda! Hahaha, imagine if the Girl Scouts had some sort of s'mores cupcake they sold instead of cookies. I bet you folks would go crazy! OMG, your comment is so poetic. Also, I didn't know you were from the Bay! I used to live in SF. I was intimidated by marshmallow meringue for a long time too, but believe me, this recipe's pretty easy. You actually just let the mixer do most of the work! 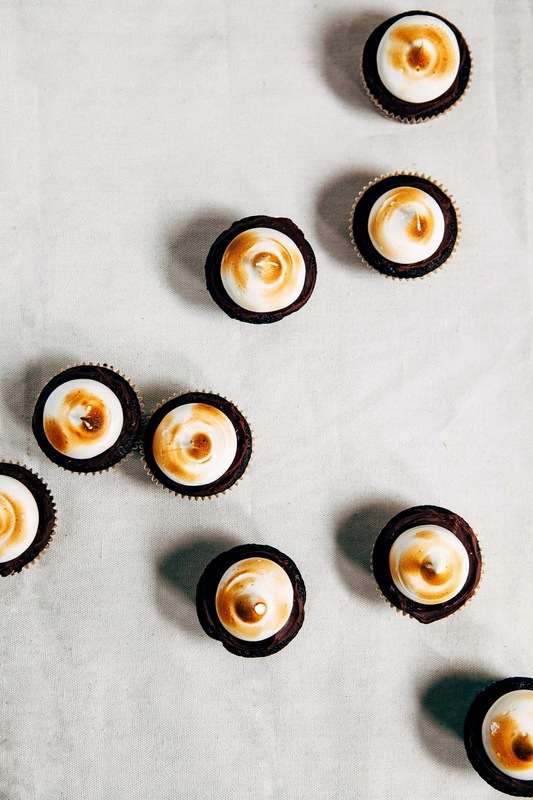 Food52 also has a great recipe for marshmallow fluff frosting that's also pretty legit. Yeah, I hate it. Also that's pretty gross that it gets stretchy. Like, really. Giiirrrrlllllll!!! These are absolute perfection. 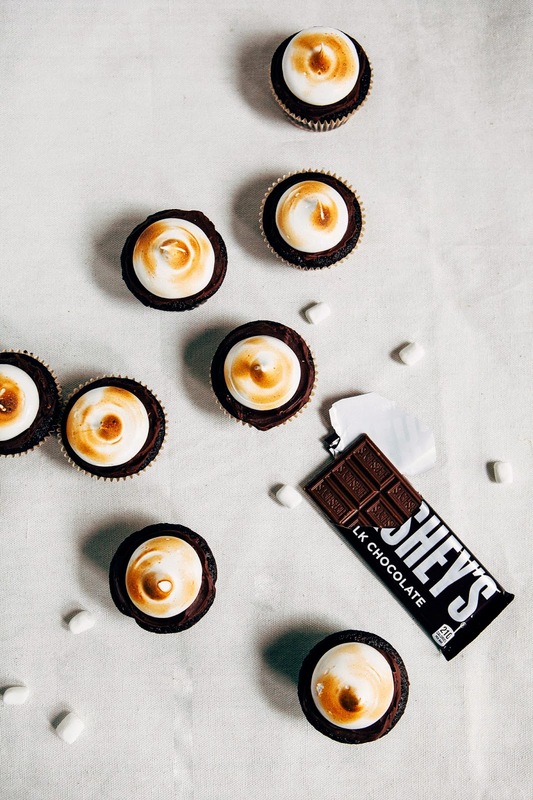 I might have to do a whole new "s'more wish list" on my blog just so I can link to these!!! I actually have a kitchen blow torch given to me by my father in law.... but I'm kind of afraid to use it. I need to bust it out for these cupcakes and some homemade creme brulee. :-D Well done, lady! Uhm..... You can come camping with me anytime! Let's do it. Except by camping, you mean go to a fancy restaurant in PDX, stay indoors and eat these cupcakes while watching a romcom, right? Awesome tip Christina!!! Will definitely give that a try the next time I make marshmallow fluff. I've always been bummed by the fact that it deflates, but maybe I just wasn't doing it right? hahahahah i died "(PS — if you're keeping count, that's TWO types of graham right there. That's what puts the DOUBLE in this recipe for Double Graham S'Mores. BOOMCHICKABOOM.)" LOVE THIS. I have never wanted to eat a cupcake more in my life! Pinned it, and now Imma stare at these until they appear in my mouth. These cupcakes are super, super, gorgeous! Good Lord, and the photographs are beautiful too. I've been wanting to try making my own graham flour at home, I just need to get a small mill. I love the old fashioned "7 minute frosting" which is similar yet slightly different to your recipe in method and ingredients, and it never fails to yield perfect marshmallowy frosting in 7 minutes and it has never deflated on me. You can torch it too. Yeah, you definitely killed it with this one. And you're totally right about the Hershey's chocolate. Nothing wrong with an un-restrained cupcake... in fact EVERYTHING RIGHT! I love love love the look of these with their pretty tops and biscuity bottoms - yum! I don't even know where the start with these...anything with triple chocolate in the name has me weak at the knees but then, that fluffy marshmallow frosting? Absolute killer. The whole thing is just TOO GOOD. Ha, thanks! No story for this post this week, I just wanted the cupcakes to shine. Glad I made you laugh though! Thanks Nik! I was just over at your blog, and you have been KILLING it lately. Those fortune cookies you made?! Swoon. They're at the top of my "to bake" list! Thanks Renee! Also, yeah, it's crazy how many people actually dislike Hershey's chocolate. How are they still around? Aw, Kathryn, thanks! Inspired by your buckwheat crepes, I've been playing around with using graham flour for crepes but they aren't quite as good. :-/ Oh well! Oh nooo. Maybe you could substitute some sort of whole wheat flour instead? Or oat flour? Something with a nice nutty undertone would work best. I love, love working with graham flour. It works so well with chocolate and it gives cakes/crumbs a toothiness that is just perfect. I hope you get a chance to try working with it soon, and let me know when you do! These look amazing, Michelle! I love how over the top they are--at first I didn't even notice the layer of chocolate frosting under the marshmallow! I am kind of intimidated to try this, but at the same time, I know I should try this. It looks so incredible! And you photos are killer, as usual. Hhahah do it! I love using my chef's torch (though I recently broke it after bruleeing these cupcakes — I think I went too overboard with this recipe, lol). Don't be intimidated! Once you break it down, the recipe is super easy, I promise. The only part that I was initially intimidated by was the marshmallow fluff frosting, but honestly, with a candy thermometer and a good mixer, it was pretty much a cinch. The frosting is even pretty easy to pipe! Oh my. . .my tummy is a rumbling for these. And I loved that you started these off with a graham cracker crust. These are the cutest cupcakes. Although smores are typically a summer treat, I feel like they totally work for right now - wouldn't a huge bonfire and smores be great? We're covered under a mountain of snow up here in eastern Canada. Ever since I read your original post about graham flour, I've been on the hunt, but so far unsuccessfully. You sell it so well. whoa! Michelle, these looks absolutely INCREDIBLE. What a beautiful, informations, drool worthy post. These cupcakes are perfect. uh.. totally meant *informational.. See? these pictures made me a bit too excited! DOUBLE gram? You know what’s up. Beautiful! This recipe was made at 14,000ft above sea level in a remote area of the Puncak Jaya mountain range in Papua, Indonesia, and the results were perfect! I've tried other thigh-altiitude cupcake recipes with no success. This is a keeper! S'mores cupcakes - after I saw them years ago on Linda's blog (that video is seriously amazing), I made them for a New Year's Eve party and, needless to say, they were a huge hit (imagine me blow-torching that stuff; no more show acts needed). I love your version with an extra dose of chocolate. Cute & delicious!